Connor Wood, a fifth-year guard from the Carleton Ravens, was named the 2017 U SPORTS Men’s Basketball Player of the Year, Wednesday night. Wood, a psychology student from Guelph, Ont., and last year’s Jack Donohue Trophy winner for U SPORTS Championship MVP, marks the eighth Player of the Year honour for a Ravens player. Other U SPORTS award winners announced during the All-Canadian Awards Gala were Ottawa guard Caleb Agada, Defensive Player of the Year; Laurentian guard Kadre Gray, Dr. Peter Mullins Trophy (Rookie of the Year); Carleton’s Dave Smart, Stuart W. Aberdeen Memorial Trophy (Coach of the Year); and Dalhousie foward Kashrell Lawrence, Ken Shields Award (Student-Athlete Community Service). The 2017 ArcelorMittal Dofasco U SPORTS Final 8 gets under way Thursday, March 9, at the Scotiabank Centre in Halifax, N.S,, hosted by Dalhousie University. Semifinals will be airing live on Sportsnet 360 and SN Now on Saturday, March 11 at 12 p.m. and 2:30 p.m. ET, with the finals airing Sunday, March 12 at 1 p.m. ET. The rest of the tournament will be available for online streaming at TV1 webcast. Carleton Ravens fifth-year guard Connor Wood is the 2016-17 Mike Moser Memorial Trophy recipient as U SPORTS Player of the Year. Wood, a native of Guelph, Ont., becomes the fifth Carleton player to receive the award, and the first since Philip Scrubb in 2013-14. In his final university campaign, the 6-foot-4 senior posted phenomenal scoring numbers, averaging a career-high 19.2 points per game, while shooting 50.8 per cent from the floor. As one of the country’s most prolific sharpshooters, Wood ranked second in U SPORTS men’s basketball with 76 three-pointers made, while his 50.3 percent conversion rate from the beyond the arc was the third highest total across the country. 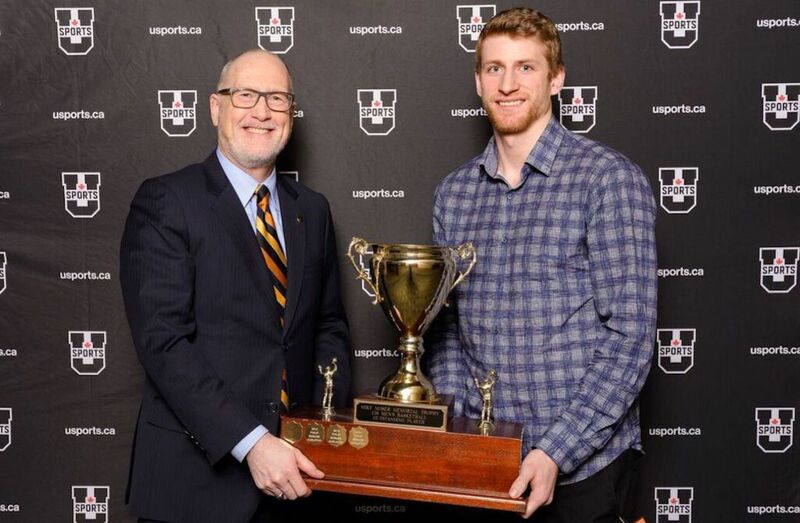 Over the course of his distinguished university playing career, Wood has won four national championships, two OUA Wilson Cup titles, the 2016 Jack Donohue Trophy as Men’s Final 8 Most Valuable Player, two U SPORTS Men’s Final 8 all-tournament selections, and three OUA All-Star awards, including one First-Team selection and two Second-Team nods. The other nominees were guard Conor Morgan of UBC, forward Kevin Bercy of StFX and guard Dele Ogundokun of McGill. Caleb Agada is the 2016-17 U SPORTS Defensive Player of the Year, winning the national award for the second year in a row. The fifth-year Gee-Gee, originally from Burlington, Ont., earns the award thanks to an outstanding combination of steals, rebounds and solid face-up defending. The 6-foot-4 economics student continued to make the most of his length and quickness and collected 49 steals this season to rank third in U SPORTS with 2.9 per game. Agada was also the second-leading rebounder for Ottawa, pulling down 6.4 per game. A three-time OUA First Team All-Star, Agada finishes his career with 578 rebounds and 1137 points in regular season play, and represented Canada at the 2015 Summer Universiade. "Caleb continued his explosive play on the defensive end again this year. His length, speed and anticipation make a threat to steal a pass, block a shot or pull down a big defensive rebound at any time,” explains uOttawa head coach James Derouin. "Caleb showed this year he could guard all five positions and lead his team to become one of the top defences in the country." Agada is the fourth player to repeat as U SPORTS Defensive Player of the Year. The other nominees were guards Ritchie Kanza Mata of Dalhousie, Dele Ogundokun of McGill, and Jordan Jensen-Whyte of UBC. Kadre Gray of the Laurentian Voyageurs is the winner of the Dr. Peter Mullins Trophy, given to the U SPORTS Men’s Basketball Rookie of the Year. He was also named to the U SPORTS All-Rookie team. The 6-foot-1 guard led the OUA and U SPORTS in scoring this season, averaging 23.2 points per game. A Human Kinetics major, Gray becomes the first Voyageurs rookie to be honoured at the national lever since the inception of the award in 1987-88. He is also just the third Voyageurs player to earn national recognition after Brad Hann was named the Ken Shields Award winner in 1994-95 and Charlie Wise was named the Player of the Year in 1977-78. A product of Toronto’s famed Eastern Commerce, Gray came out of the gate flying to start the season and never looked back. He finished second in the country in total points (441) and free throws made (130), was ranked in the top 10 in field goals made (141) and minutes played per game (33.5), came in the top 20 in free throw percentage (80.7) and steals (37) and was 22nd in assists (69). 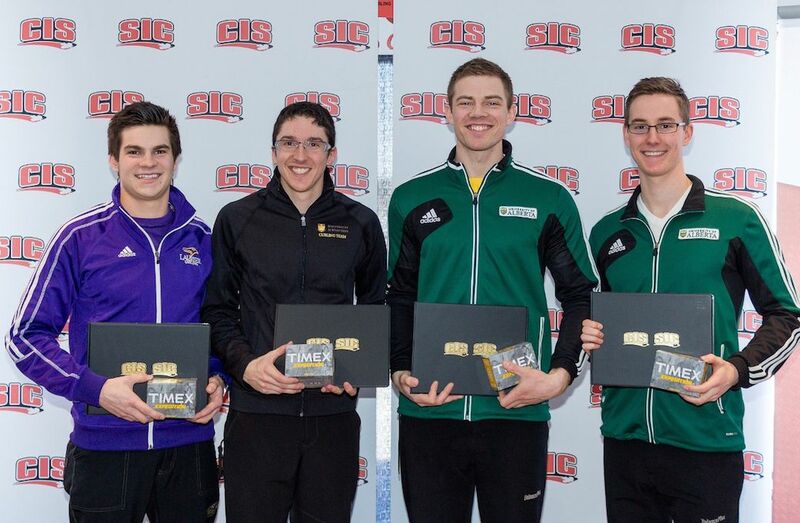 Gray’s U SPORTS All-Rookie Team nod is the first for a Voyageur since 2009-10 when Manny Pasquale was honoured. The other nominees were forward Jamaal Potopsingh of UNB, guards Scott Kellum of Victoria, and Kendrick Jolin of McGill. For the eighth time in his distinguished career, and for the first time since the 2013-14 season, Dave Smart is the recipient of the Stuart W. Aberdeen Memorial Trophy as 2016-17 U SPORTS Men’s Basketball Coach of the Year. Following his one-season absence from the Carleton sideline while working with the Canadian senior men’s national team, Smart returned to the Ravens where he guided Carleton to its first undefeated regular season (19-0) since 2013-14. The Ravens held the country's No.1 ranking for all 14 U SPORTS polls, winning by an average of 33.4 points per game. Behind Smart's unwavering dedication and commitment in all facets of the game, Carleton finished second in the nation in scoring (92.0 points per game) and first overall in scoring defence (58.6 points per game). In his 17 years at the helm of the Ravens program, Smart has won 11 national championships, nine OUA Wilson Cup conference banners and 10 OUA Coach of the Year awards - all record-setting totals. The other nominees were Rick Plato of Dalhousie, Kevin Hanson of UBC, and David DeAveiro of McGill. He also led Dalhousie in rebounding, with an average of 6.8 per game, and had 1.9 steals per game. Lawrence has served as a captain of the Tigers for the past three seasons. He is vice president of Dalhousie’s varsity council. He is a member of the Tigers’ executive team for SAMHI—the student-athlete mental health initiative—and he played an integral part of promoting the Bell Let’s Talk Day initative on campus. “In my 35 years of coaching, few student-athletes have demonstrated such excellence on the court and such selflessness off of it,” said Tigers head coach Rick Plato. “From the outside, Kash appears as an imposing, fearless competitor. But, as the saying goes: ‘Don’t judge a book by its cover’. I have come to know Kash as a compassionate, concerned, and thoughtful individual who always puts others first. The other nominees were guards Ryan Bennett of Brock, Phil Jalalpoor of UBC, and Charles Miller of UQAM. F Kevin Bercy StFX 4 Kanata, Ont. Business Admin.